Running speed is a tool that you are born with. There are athletes who have been able to improve their speed a step or two by adding strength in their legs, increasing their lower half flexibility, performing plyometric exercises, and just by practicing their form and running, but those athletes had that potential already built in and had not adequately developed it. If hard work was all it took to run a 6.3 second 60 yard dash, then baseball would be full of players who could steal 80+ bases a year. Hard work, however will give you every opportunity to be your best. Speed is a valuable commodity for running the bases - and scoring runs - and for defensive range. Quick ballplayers can catch more balls because they can get to more balls. 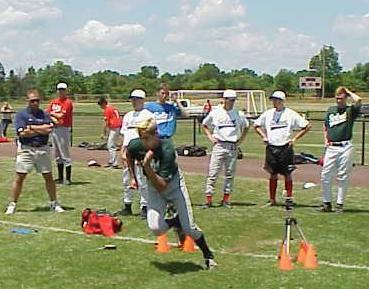 When it comes to evaluating speed, there are Major League clubs who make it mandatory for their scouts to run prospects in the 60-yard dash. Most clubs look for times under 7.00 in the "60". Times of 6.7 - 6.9 usually equate to an average runner on the playing field. Of course anything faster is considered above average. The universal way to scout speed on the playing field is to time hitters from home to first base. The scout starts the stopwatch on "contact," or as the bat is hitting the ball; It is important to anticipate the swing to get an accurate time. Most scouts will click their watch as the ball is crossing home plate, whether the batter swings or not, in anticipation of contact. The scout then stops the watch as the hitter's foot touches first base, again anticipating the contact to stop the watch as accurately as possible. Since left-handed hitters are a step closer to first base, their times are graded a 10th of a second quicker. Of course, a player's position adds importance to the running times. A catcher's or first baseman's running time is expected to be below average, or worse. There are catchers in the Major Leagues who run 4.8 to first base. There are power hitters in the outfield who run 4.6 to first, but hit 30+ homeruns a year. Speed IS important for shortstops and centerfielders, and to a lesser extent, second baseman and third baseman. The bottom line is this: If you are not going to be a power hitter or drive in a lot of runs, you had better score runs or take-away hits and runs with your speed and glove. The times to first base can be deceiving if the hitter has a swing with a long follow-thru, because those hitters are slower to get out of the batter's box. It is essential that a scout watches a player run around the bases - for example running from first to third - in order to get an accurate feel for a player's true speed. An outfielder can show his true speed by running down balls in the gaps or to the fence. Stealing bases is also another way to display your true speed. So, these running times are a reliable indicator of speed, but they are not always the whole truth.